18 Apr 2010 Added graduate photos for the Class of 1968.Graduates. 7 Mar 2010 - Added class photos for the Class of 1969. Teachers and Staff, Graduates, and misc. 23 Aug 2009 - A classroom photo added to 1894. A new page, 1897, added with a Senior Class photo. 30 Mar 2009 - A memoir from Chris Arellano who was fortunate to have two parents who graduated from Poly. His misfortune is that he didn't go to high school there. 04 Mar 2008 - A redesign of the Perennial Parrot page and the announcement that those crazy kids from the 50s now have their very own web site! A new essay from Mario Barrios who went to Poly in the mid 1950s. He's unique because he went back to Poly in the 60s as a teacher, albeit as sub for only a day or two. Slight redesign of the front page to improve usability. 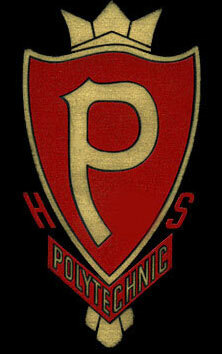 A new essay from Victor Turks '63 on life at Poly in the early 1960s. Material, prepared by Kathy Compagno '64, added to 1941, 1945, 1950 and World War II. Material, prepared by Kathy Compagno '64, added to 1912, 1942, 1943, 1944 and 1947. Material, prepared by Kathy Compagno '64, added to 1894, 1906, and 1941. New page added: "Upcoming Poly Events"
HailPoly proudly presents "The Perennial Parrot". Page added. In 1955 a delightful tale of high school high jinks. Added. Added a page of pictures from 1984 and 1987 supplied by Bob Ross, Class of 1955. Yearbook pages added to 1945. Added a "Contact" page. 13 May 2007 - Created a "top" page for 1958 which leads to Bob Zimmerman's essay on life in San Francisco and a page of 1958 yearbook pictures. Replaced opening page picture. From 1945 football team to a view of Poly seen across Kezar Stadium. Added a "Contact" page. Yearbook pages added to 1962. Yearbook pages in 1924 and 1911. Added photos to 1970 and 1971. Accessed through 1970. Slight redesign of the opening page adding a list of web ideas to be added. Slight correction to the preliminary opening paragraph of the 1940s. Added newly acquired yearbook covers for 1945 and 1947. A new essay from Bob Zimmerman '58 on life at Poly and San Francisco in the 1950s. 25 March 2007 - Corrected yearbook labels in 1940 and 1950. 11 February 2007- Pictures added to decade selections on home page. 13 January 2007 - 1945 page started and can be accessed through 1940. 01 January 2007 - HailPoly.com on-line for the first time. Just a skeleton and much work to be done.